The strength or amount of correction. The curve of the contact lent’s back surface. The width of the contact lens. The brand name of the contact lens. That are tinted in order to see it in a lens case (they do not change eye color). Are designed to intensify or slightly alter the natural color of the eye. Are designed to change even a dark eye color. The natural color of the eye doesn’t show through the lens. The additional correction for bifocal contact lenses. 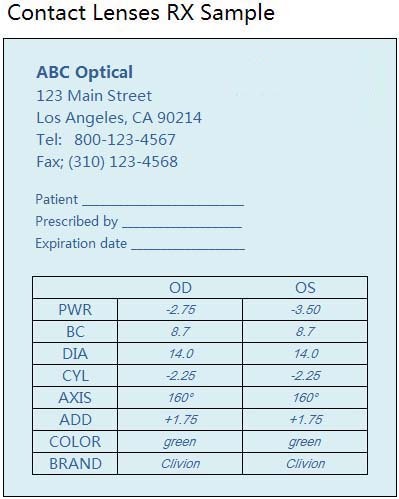 Correction for Astigmatic patients (toric lenses only). Prescription information for the left eye. Note: if both the right and left eye are the same prescription, this will be indicated by an OU. Prescription information for the right eye. Thissection provides basic information about eye care providers and eye exams. The first step to wearing contacts is visiting an optometrist or ophthalmologist for a contact lens fitting, even if you don't have a vision problem and just want to change your eye color. Contacts come in many sizes, and during your exam your eye care provider will measure your eyes to determine which size is right for you. If you already wear contacts but want to try a different brand, you will need to see your eye care provider to be fitted for that brand. Once you have been fitted for contact lenses and have your prescription, you are ready to purchase from Clivion Store. When you schedule your eye exam, it is important to ask the doctor's office two questions: 1) Do they release contact lens prescriptions? ; and 2) Will they prescribe you a national brand that can be purchased anywhere? The federal requirement to release prescriptions is new, so it helps to ask. 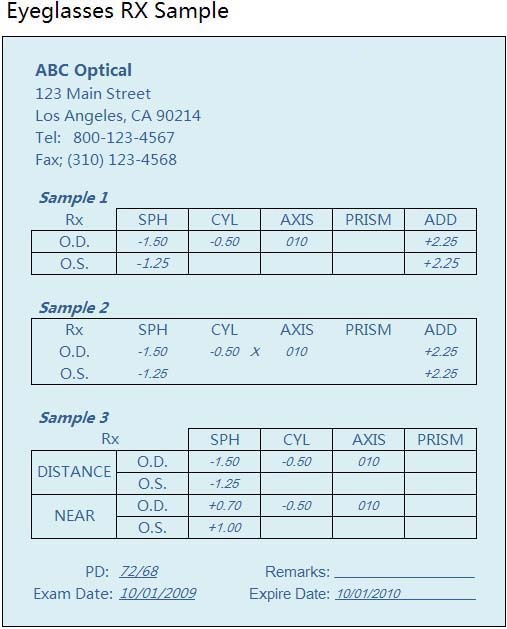 In addition, contact lens prescriptions are brand specific and most often cannot be substituted. If prescribed a doctor exclusive brand your options for shopping around are very limited. Is it the same as my eyeglass prescription?